Lawn bowling is easy to learn, very low cost, and provides gentle, healthy exercise and pleasant social company. Every day thousands of people drive up and down Embarcadero Road in Palo Alto without realizing that tucked away behind the trees and the ivy at Embarcadero Road and Cowper Street is one of the most charming lawn bowls facilities in California. 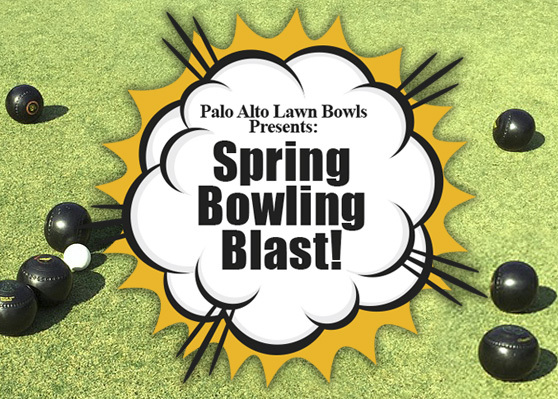 Palo Alto Lawn Bowls Club (PALBC) has been a part of the Palo Alto community since the 1930s. When the gates to the club are open, the public is welcome to visit, watch the game, and talk to members about the game. Visiting bowlers from other clubs anywhere in the world are welcome to join in our draw games at no cost. No need to wear “whites,” just flat-soled shoes. We have loaner bowls for you to use. PALBC is open year-round for your bowling pleasure. Tuesday, Thursday, Saturday: 10:00 a.m.
Tuesday, Thursday, Saturday: 12:30 p.m.
Join us for Spring bowling Blast! Spring Bowling Blast is on five Wednesdays, March 20 - April 17, from 6:00 p.m. to 7:15 p.m. Learn the basics of lawn bowling through group lessons and games. Register through the Palo Alto Recreation Department’s Enjoy catalog or contact John Hickson, j.hickson@sbcglobal.net. Cost is $20 for the five-sesson class. Drop-in on a Sunday at 1:30 p.m. (weather permitting) and a coach will be on the green to get you started. Or contact John Hickson, j.hickson@sbcglobal.net, 650.376.9499 to schedule a free private lesson.